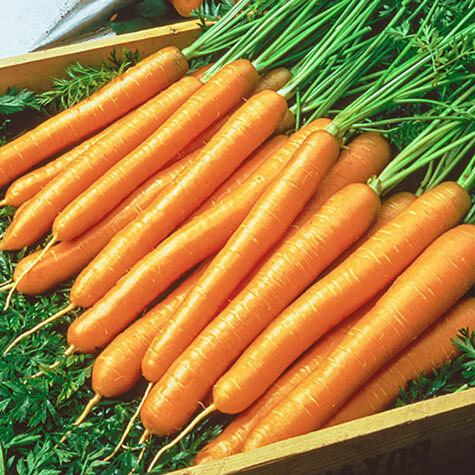 Tendersweet Carrot | Gurney's Seed & Nursery Co.
How sweet are Tendersweet Carrots? One gardener describes them "like candy for supper." We describe them as the sweetest on the market and oh-so-crisp. The uniform, deep orange-red roots are smooth skinned, fine grained and nearly coreless—and they grow 9-10 inches long, and often longer. The gorgeous color stays during cooking and freezing. Year after year, this Gurney's Choice variety receives rave reviews from gardeners for their sweetness and flavor. 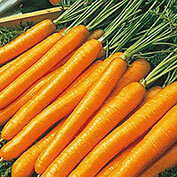 Did you know that carrots grow best when planted in light, fertile, deep, well-drained, sandy loam soil? Many gardeners sow radishes with carrots to mark rows and conserve space. 75 DAYS. Botanical Name: Daucus carota ssp. Sativus 'Tendersweet'; Family: Umbelliferae/Apiaceae (Carrot Family). 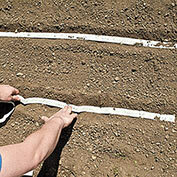 Spacing: 2 - 3 inches between plants and 12 - 14 inches between rows. Fruit: Uniform, deep orange-red flesh. Smooth skinned, fine-grained roots and nearly coreless. Tapers to a point. Seed Count: Approximately 1500 seeds per packet, 1/2 oz. 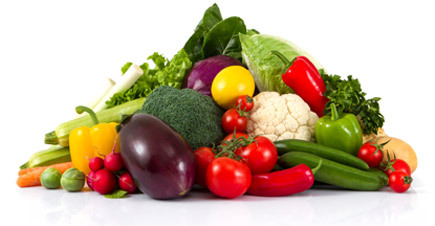 is approximately 8,000 seeds, 2 oz. is approximately 32,000 seeds. 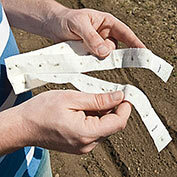 Seed tape is 15 feet long and has approximately 415 seeds. Size: 9 - 10 inches. Comments: Color stays during cooking and freezing. Sugar-sweet and crisp. Leaf stems are purple tinged. Considered tops for taste.